Pax Christi members: You are invited to join this vigil. Then stay on for pizza and our meeting afterwards! Come see us at the Seneca County Fair! Tiffin Area Pax Christi is sharing a double booth with Project Peace at the Seneca County Fair, July 27-Aug. 2. Stop by and see us at the Merchant Building. We’ll have free peace sign “tattoos” for the kids. Sign up for a drawing for a beautiful tapestry. Take a selfie with a life-sized Gandhi. 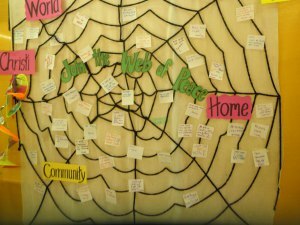 And join our web of peace! Sign a card telling us what you do or will do to build a more peaceful home, community, or world. We’re looking forward to learning about all the ways people make peace right here in Tiffin! 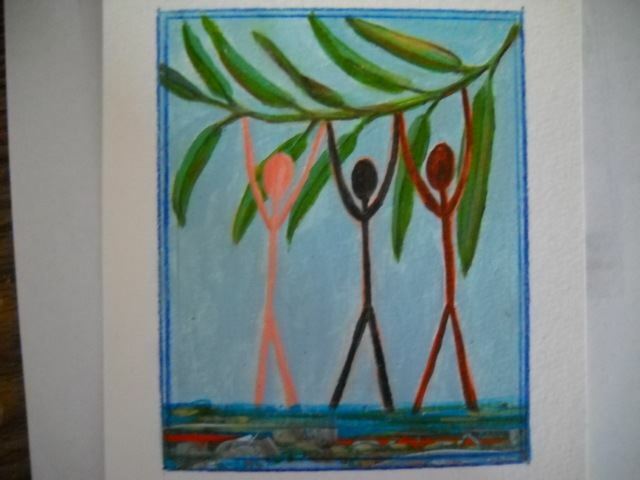 This painting by our member Jean Cossey will be incorporated into a bookmark we’ll be passing out.